I have this old telephoto lens. A Sigma 70-300 from like... 2012? I don't remember. It was a birthday present from my family. I think it was my very first non-kit lens. It's not the most amazing lens in the world. It was relatively cheap when I got it, and it's worth next to nothing now. But I've still hung onto it, in spite of having a volatile love/hate relationships with it. In 2014 I decided I wanted to sell it. But I knew that I was feeling a bit bitter about it because I never used it. I was also keenly aware of the pitfall of gear acquisition syndrome. Of course I wanted a “better lens” because I was a better photographer than when I got the lens, so I must have outgrown its use. That’s a lie by the way, I don’t know if I will ever understand my gear so well that I can actually use it to its complete full potential in any situation. That’s just my consumer-trained brain trying to convince me that I should have something shiny and new and “better”. So I decided I had to spend an entire month shooting exclusively with the 300 before I could sell it. After that month I decided I that while I still didn't really understand it, I'd hold onto it anyway. I've since used it a fair bit, but still not often pleased with the results. I like its macro capabilities, so that's most of the reason I've hung onto it. When I really started getting into bird photography last year I assumed it would be the best lens I had for that type of photography. My sister had taken it to Kenya and gotten some great photos on a safari of birds and other animals. So I started taking it on almost all my walks. 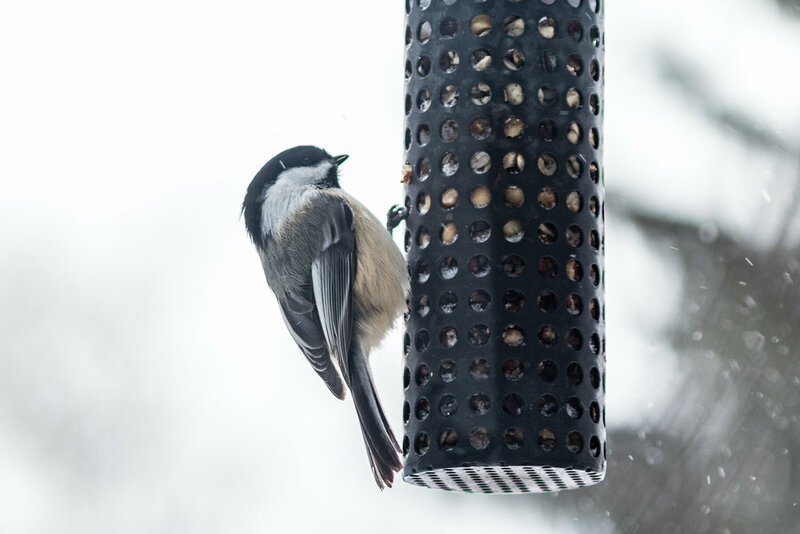 I soon grew discouraged because I could never seem to nail the focus on the birds. They were always a bit soft, no matter how fast my shutter speed was. I also hated how heavy it was. Then I ran into a friend who was shooting stunning shots with a 55-250 kit lens. I also have one of those, so I asked him about his techniques and switched to that lens. I've been pretty happy with it. It has faster auto-focus, its a million times lighter, plus it starts wider, so I can still take pictures of my dog when I'm out walking. 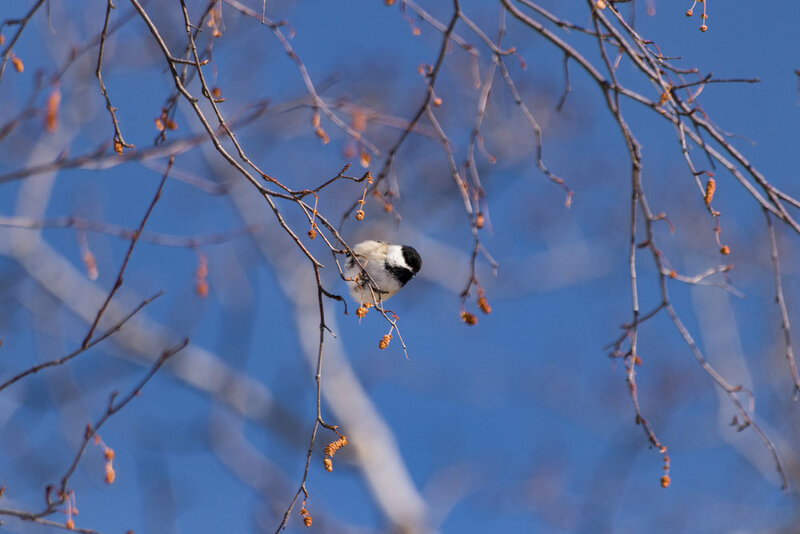 But it is just not quite long enough for those chickadees that sit 30-40 feet up in a tree and do cute things. So, frustrated again, but not quite ready to sell my 300, I started trying to figure out why I couldn't get the shots with it. I pixel-peeped my way through my photos and the meta-data, trying to find some sort of pattern in the occasional sharp shots and the consistently soft shots. Then my sister and I went through her photos from Kenya. Same thing, checking all the settings on the photos that were super sharp, and on the soft ones. I'm not as steady as my sister is. I know this is absolutely true, I cannot handhold shots as slow as she can with any lens. That lens shoots soft at its low-end aperture values. Number two is the most important one. When shooting birds I’ve consistently been keeping the aperture as low as I can, to let in as much light as possible and blur backgrounds well. I keep my shutters speed at 1000 or above, and I cap my ISO at 800 or 1600 simply because I hate grain. But shooting at 5.6, as wide open as that lens goes when its racked out to 300mm, just makes for soft focus. Most lenses tend to be a little softer towards their limits. Most lenses have a sweet spot aperture where they produce crisp sharp images best. I know this sweet spot with my 50mm lens, 2.5-2.8. I know it well because I actually set up a staged scenario and shot the exact same scene at every aperture. It had never crossed my mind to apply that theory to this lens. Apparently, it's F11, in case you were wondering. So, this past weekend I've been playing with that lens, keeping it at F11 and seeing what happens. Well, it's working. I'm finally getting the crisp sharp shots I've always wanted. 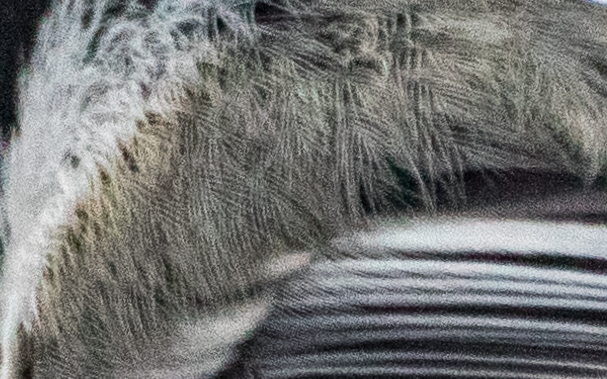 In bird photos, this means I want crisp details in feathers, clear separation between barbs of the feathers. I'm finally getting this. Zoomed to 100% you can see detail in individual barbs of the feathers. Same thing here, you can see the individual strands of each feather. You can also see how the focus drops off in the top left and I lose the sharp detail, the white just all blends together. So, next time you're frustrated with a piece of your gear challenge yourself to learn to work with it better. Ask other photographers what they think might be causing your frustration, and look for patterns in the photos that piss you off, and in the ones that you're ok with. Chances are good your gear is solid and you probably don't need to upgrade it. And sometimes it is totally ok to just go with the soft focus. I love this photo, even though the focus is super soft on it. There’s movement and story here, and honestly that beats out perfect sharpness 99% of the time.